Security is EverTrue's utmost priority! Just like your online banking system or email provider, EverTrue offers Two-Step Verification as an added layer of security. This feature requires a mobile device that can receive text messages to be in the hands of the user in order for them to access their EverTrue account. 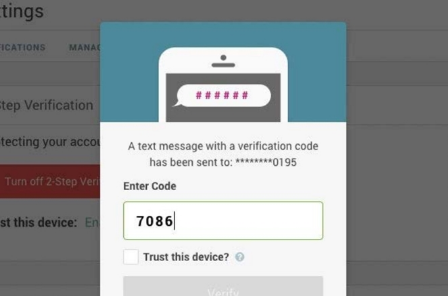 Once enabled, EverTrue sends the user a text message containing a pin code that must be entered to log in. We highly encourage each user to set up Two-Step Verification (instructions here). If you are an EverTrue Owner/Admin, you can see which of your team members have or have not implemented this security feature by going to Settings >> Manage Team. Next to the user's name and under the 2-Step Verification column, you will see either a green (yes) or a red (no) icon indicating whether the user has it enabled. Please make sure all members of your team implement Two-Step Verification. Note that at this time, there is no way to enforce/require this extra step. If Two-Step Verification has not been enabled for your organization, please contact Customer Support at genius@evertrue.com to have this security feature activated. How does "Trust this Device" work? Here at EverTrue, our two-step verification feature is a little different than other services you may use, like Google. By selecting "Trust this Device" you are letting EverTrue renew your "session" automatically. Typically sessions renew every hour (due to our authentication with LinkedIn), so trusting the device allows us to bypass asking you for a code every hour. This "trust" will stick for 30 days, after which you'll be required to enter a new code and re-trust the device. However, if you log-out of EverTrue and/or your browser does not store cookies (e.g. you are in a private or incognito browsing window), then by default EverTrue will challenge your login with a code via two-step verification. The benefit here is that if your LinkedIn account password is ever compromised, EverTrue is still secure.